they were easy to move in. The knee bands would be left open, and by the early 17th century they cut it off. This was the birth of the seaman’s trousers. They were called slops until the 17th century, when the English navy introduced the ‘slop’ system. In 1628 the British Admiralty made sailor’s clothing, called “slops,” available to press-ganged men They consisted of a suit of canvas with doublet and breeches, Monmouth caps, cotton waistcoats and drawers, stockings, linen shirts and shoes. fixed prices. It was also stated that they had to be sold before the mainmast, once a week, and in the captain’s presence. In 1706, a new contract was issued by the Admiralty for the kinds of clothing that would be acceptable as slops; and they were pretty specific. The contracting system was not all that different from what we have today; that is, the government published what it wanted, and various firms bid on the contract. The winning company had to have slop clothing available at set prices to RN ships. The government even provided “sealed patterns” or samples of each garment that was available in various English ports (even in Lisbon). Sea captains needing to outfit a crew could compare the quality of the local slop supply with these samples. the price of each article. These slops lists continued in much the same vein with minor variations until 1748. Since there was no order compelling Royal Navy sailors to buy slops, this could not be considered a uniform, but it amounted to such since these were the clothes most commonly available to them. According to G.E. 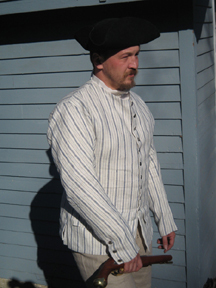 Manwaring, this is the costume that British seamen were most often pictured wearing in period prints and paintings. Grey jackets, red breeches or trousers, striped waistcoats and blue-and-white checkered shirts was the de facto uniform for this era. British seamen were not issued hats until relatively late. They were known for their thrummed and Monmouth caps in the 16th through 18th centuries. 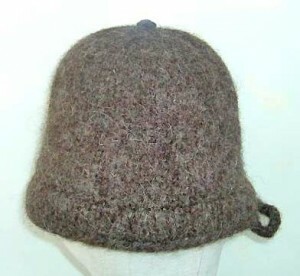 For some reason, knit caps disappear from the slops list for several decades. Despite this we know through other sources that knit hats and cocked hats were worn during this period, they just do not appear on the slop contracts during the 1690-1720 period. 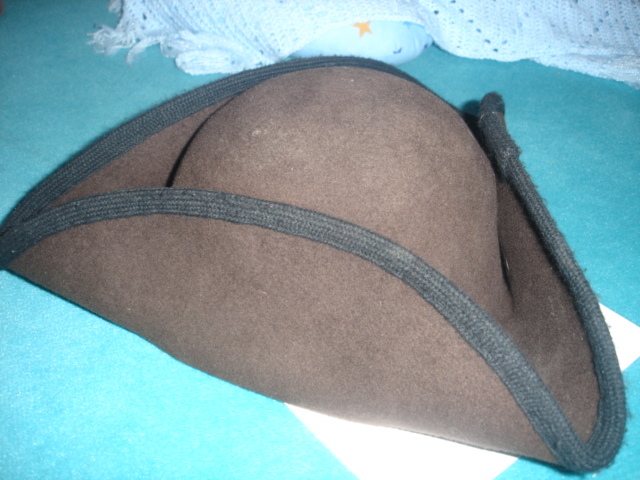 It is not until the list of 1730 that you find the leather caps replaced with “Caps, woolen milled” and “Caps, yarn”. The “Caps, Woolen, milled yarn” is repeated in 1739, when for the first time “Hats” (with no other description) is added. 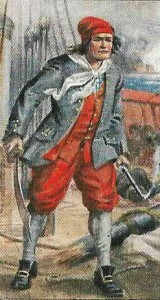 Manwaring believed that trousers were exclusive to British sailors in this era. He cites a English report from the Pacific in which some Spanish seamen recognized them as British because they were wearing trousers.